I’m not a big makeup gal. Like many people, I like to look nice but natural, quickly, with minimum fuss and expense. Mostly, in fact, I just wear Benetint and lip pencil. But recently I decided to update — nobody likes to look like they’re still stuck in the last decade 🙂 — and being me, I over-researched it to death. The ladies over at Makeup Alley know what works. 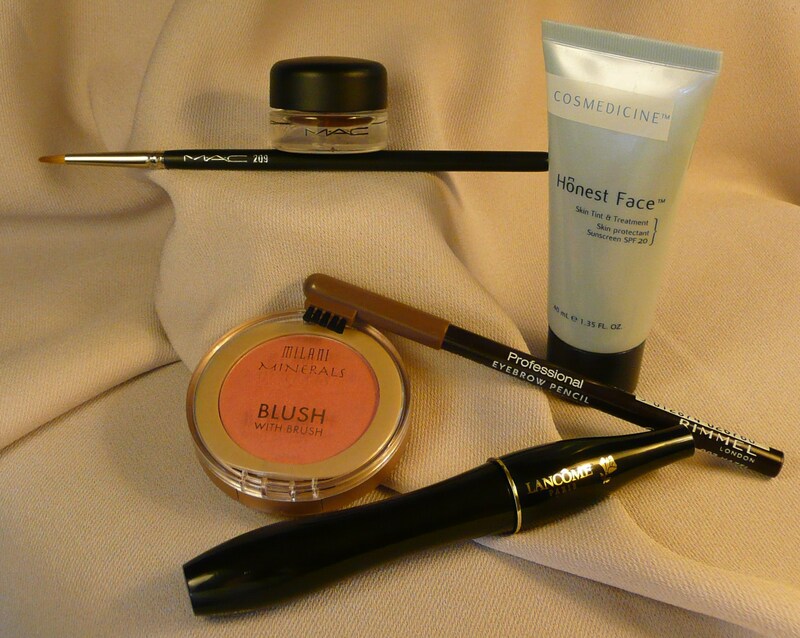 These are my choices for products that really improve your looks without taking extra time or looking like makeup. MAC Fluidline gel eyeliner, $15: A top MUA favorite, it applies smoothly and easily in thin lines of semi-translucent color, so it looks much more natural than a traditional liquid liner. It doesn’t take any longer than an eye pencil to apply, doesn’t wear off through the day and doesn’t tug on your eyelid as it goes on. In a natural color like Dipdown brown, this really achieves the goal of enhancing the eye without looking like heavy makeup. Tiny pot lasts a long time. You do have to buy a brush, though. Milani blush in Luminous, $5.49: One blush is far and away the favorite of the MUA reviewers, but it’s a Nars product that sells for $24, in a color described as “universally flattering shimmering peachy pink blush with an extra dose of golden sparkle.” This blush for sale at Walgreens is a color match. It’s a nice peachy change from Benetint, my standby “natural” blush. I used to not be able to apply powder blush so it looked natural (see: 1980s), but the light color of this blush and a big ol’ brush work fine. Lancome Hypnose mascara in brown, $24: A splurge, but this mascara gives the classic “you, only better” effect: It looks pretty natural (in brown, at least) and your eyes are dramatically highlighted. Wears well in heat and humidity, so no touch-ups. It has a 4.1 rating in 777 reviews on MUA, a strong recommendation. Rimmel Professional Eyebrow Pencil in Hazel, $3.49: Also well-rated on MUA and cheap at the drugstore! Eyebrow pencils are my pick for most dramatic effect on your face without being visible at all. I never bothered with them before, but now I take the extra 0.2 seconds; it’s a big but subtle difference. I learned to use the lightest brown I can, though 🙂 This pencil has a little brow brush on the cap, too. Tinted moisturizer: More sheer and natural-looking than a traditional foundation, plus moisturizer and usually SPF, so it’s all one step. The MUA ladies have lots of favorite tinted moisturizers; I got Cosmedicine Honest Face, $35, because I happened to be at Sephora, which makes it. I like it as a replacement for my traditional base but might try others. I still don’t wear all the eye stuff every day, but now when I want to feel extra spiffy I can do it fast and not feel like a clown. The new blush and base got me out of my every-day-looks-the-same routine. Plus it’s probably good to be moisturizing and SPFing regularly, so now I am. Not a bad outcome!